The 7pm service at the Blackwood Hills Baptist Church on Sunday the 19th of August 2012 will be the conclusion to the official part of this year’s campaign. Judd Field from the Melbourne Gospel choir will be performing and sharing with the congregation. We hope that some people from the Blackwood Uniting Church will be able to attend this service. Thanks Bethany Thompson and Jeremy Griffith. We are very grateful to receive your overwhelming support and thank everyone for their generous donations. Your support and participation will help struggling communities in East Africa realise their vision for clean water and enough food for everyone to eat. If you would like more information or would like to be involved this year, please contact Bethany on 8278 8497 or speak to Jan Thompson. 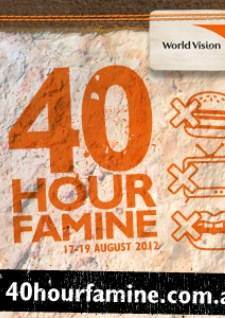 Please click this link to visit the 40-hour Famine website. Mitcham Hills Inter-Church Council join the whole Blackwood Community in supporting this appeal. Click here to read the article “Leading fight on poverty” in the Hills and Valley Messenger, 1 June 2010.